The International Chess Federation has published the July 2013 ratings list. Magnus Carlsen remains way ahead of his colleagues in first place, he is 49 points above Levon Aronian. 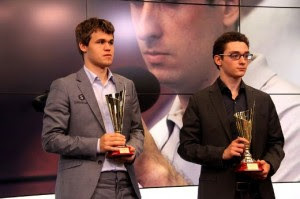 The main highlight is the presence of Fabiano Caruana in third place. The 20-year old Italian has risen straight to the top of the charts in the last year and a half and seems to be ready to fight for first place with Carlsen in the upcoming years. World Champion Viswanathan Anand did not have a good run lately, and has fallen to the eighth place, staying right above his two last challengers for the crown, Boris Gelfand (9th) and Veselin Topalov (10th). Even though he has not been playing as much as before, Alexander Grischuk continues showing his great strength and is now fifth with 2780 elo points. However, the player who had the biggest leap forward was Cuban star Leinier Dominguez, who won 30 points thanks to his victory in Thessaloniki; he is now 13th in the list. Judit Polgar still leads the women’s list with a big margin. Dilijan Grand Prix winner Humpy Koneru is second, followed closely by Hou Yifan and Anna Muzychuk. Great job there for Fabiano Caruana he is only behind Topalov in the GP series total. Follow Chess Queen Kosteniuk on Twitter!